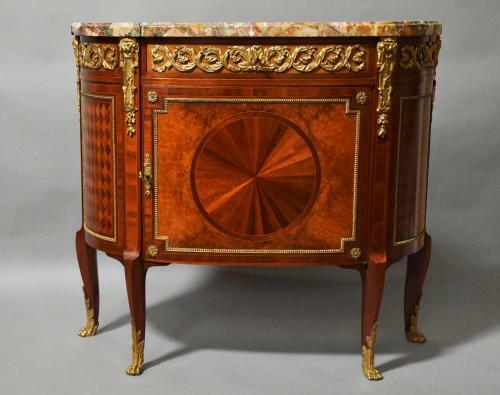 This commode consists of a richly coloured, finely figured shaped marble top (most probably Breche de Vendome) of bow form with a moulded edge in very good condition. The Breche de Vendome marble is a blend of yellow, cream, violet and green colours, it is sourced in the Pyrenees region of France and has been quarried since the 18th century until the present day, it was particularly popular in the early 20th century, often used for the tops of tables, chests and cabinets etc. Below the marble top is a frieze drawer with original lock and key with a highly elaborate foliate scrolling and entwined ormolu moulding leading down to a highly decorative single door, also with original lock and key. The sides are shaped to form the bow shape of the piece, each side having identical elaborate ormolu frieze to the top leading down to a Kingwood and boxwood stringing with ormolu moulding. Within this moulding is a parquetry (geometric inlaid design) panel of Kingwood, boxwood and ebony. At the top of all four legs in between the ormolu frieze are four fine quality and sophisticated ormolu mounts depicting mythical creatures with lions heads and foliate decoration. The piece is supported by four cabriole legs leading down to fine quality ormolu mounts of foliate design terminating with a paw foot. The interior has a shelf, this is not original and has been replaced with a glass shelf at some time. This commode/cabinet is of superb quality, is in excellent condition for age and can go straight into a home.